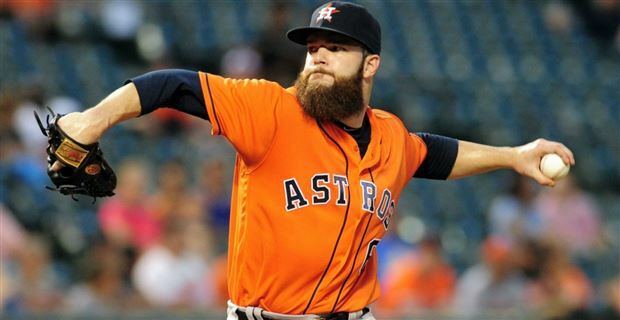 Senior Fantasy Baseball Expert Shawn Childs analyzes each batter and pitcher from the Houston Astros as they look to win back-to-back World Series titles in 2018! The Astros won their first World Series in the teams 56-year history. Houston’s success was driven by an explosive offense that led the majors in runs scored (896), and they finished second in home runs (238). They scored 172 more runs than 2016 (724). A timely trade to acquire Justin Verlander helped solidify the starting rotation. The Astros placed 5th in the AL in ERA (4.12) and 17th in the majors in bullpen ERA (4.27). In the end, they allowed one fewer run than 2016 (701). The only change on the offensive side was the retirement of OF Carlos Beltran and the loss of OF Cameron Maybin to free agency. The core of the offensive ranks with the best in the game with multiple players just reaching the prime of their career. Houston traded 3B Michael Feliz, SP Joe Musgrove, RP Michael Feliz, and OF Jason Martinto the Pirates for SP Gerrit Cole. SP Mike Fiers, SP Francisco Liriano, RP Luke Gregerson, and RP Tyler Clippard opted for free agency. They signed RP Joe Smith and RP Hector Rondon to help improve the bullpen depth. This team has three potential aces with upside in the bullpen and the backend of the starting rotation. 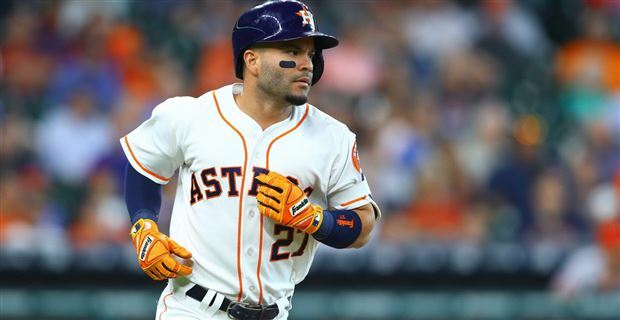 2B Jose Altuve remains a stud of studs while SS Carlos Correa and 3B Alex Bregman will push their way to the top echelon of player in baseball going forward. The Astros are the early AL favorite to reach the World Series for the second straight year. Springer had a huge jump in his approach in 2017. His K rate (17.7) was well above his career average (23.6) with his third straight year of improvement while maintaining a high walk rate (10.2). His AVH (1.845) is trending toward his number in the upper levels of the minors. His lower total in strikeouts led to a sliding CTBA (.355). George delivered a mid of the order RBI rate (19) for the first time of his career. In late July, Springer missed a couple of weeks with a quad injury. After a slow April (.230 with seven HRs and 14 RBI over 87 at-bats), George offered impact starts over the next two months (.313 with 47 runs, 17 HRs, and 38 RBI). He had another explosive run over the first nine days of July (.500 with three HRs and ten RBI over 38 at-bats). Over the last 47 games of the season, his bat lost value (.228 with seven HRs and 19 RBI over 30 at-bats). He played well against lefties (.301 with nine HRs and 19 RBI over 133 at-bats) with strength vs. RH batters (.277 with 25 HRs and 66 RBI over 415 at-bats). Springer has a rising groundball rate (48.3 – career high) and a growing HR/FB rate (22.8). The key for more home runs will be a bump in his fly ball rate (33.8). Misplaced leadoff hitter whose never reach his potential in speed. His skill set is moving toward the middle of the batting order, which means a run at 40+ HRs with 120+ RBI. Tricky piece to a winning piece to the puzzle as his overall stats don’t separate himself from the upper hitting player pool. More of a bet on the come as the 30th player off the board in 2018. Based on his final stats in 2017 within a 12-team Roto league environment, George was the 25th ranked productive hitter. Bregman got a lot of respect in drafts in the high-stakes market in 2017. His bat was extremely quiet over the first 266 at-bats of the season (.244 with eight HRs, 26 RBI, and six SBs) giving Fantasy owners the feeling they made a mistake on draft day. Alex was a much better hitter over his last 77 games of the season (.321 with 57 runs, 11 HRs, 45 RBI, and 11 SBs over 290 at-bats). HIs K rate (15.5) was much better than his short at-bats in the majors in 2016 (24.0) with an improving walk rate (8.8). Bregman hit .331 with seven HRs and 19 RBI against lefties in 142 at-bats with below league average results vs. RH pitching (.268 with 12 HRs and 52 RBI over 414 at-bats). His swing path was balanced last year with fade in his HR/FB rate (10.2) compared his short resume in the minors (18.8 in 2016 at AAA). In his two years in the minors, he hit .300 with 24 HRs, 95 RBI, and 20 SBs over 586 at bats. His K rate (10.0) was extremely low while taking a high rate of walks (11.2 percent). Great skill set going forward with added value by qualifying at shortstop. Pretty much a steal on the 2/3 turn in 15 leagues. I expect him to hit near the top of the Astros batting order while delivering impact runs and a winning batting average. Alex has the makings of a 25/25 player with more upside with more experience in the majors. Altuve led the American League in hits in each of the last four seasons with three of those seasons leading to batting titles. His CTBA (.403) was a career-high with two straight years of improvement. Jose’s high volume of at-bats helps his counting stats and pushed his HR total higher. His AVH (1.583) had growth in each of the last four years, but it’s in an area where you would expect a player with about 25 HRs. He had a spike in his K rate (12.7) while remaining in an elite area. Altuve set a career high in his walk rate (8.8) for the second straight season. He hit over .300 in each of the first five months highlighted by an electric July (.485 with four HRs, 21 RBI, and eight SBs). Jose had almost equal success against righties (.344 BAA) and lefties (.353). Even with 24 HRs in each of the last two seasons, he has a low fly ball rate (32.2 in 2016 and 32.7in 2017). Altuve set a career high in his HR/FB rate (14.6). Looking back, Jose signed a bad contract in 2013 (four years for $12.5 million with two short club options – $6 and $6.5 million). Getting close to free agency, so a continued push will lead to a huge payoff. The question a Fantasy owner has to answers is: can the beat go every year? A great five-category player who continues to get better. His speed and high batting average combination is a limited commodity especially when you add his edge in runs, HRs, and RBI. This season he’ll be a top-five pick in most Fantasy drafts, and he’s earned the right to be called a stud. Possible combined 200 runs and RBI with 20+ HRs and 35+ SBs while offering a huge batting average edge. A torn ligament in Correa’s left thumb cost him about seven weeks of the season. Before the injury, he hit .321 with 64 runs, 20 HRs, and 66 RBI over 324 at bats. This start projected over 550 at-bats would have led to 110 runs, 34 HRs, and 113 RBI. When Carlos returned in September, he hit .299 with 18 runs, four RBI, and 17 RBI in 97 at-bats. HIs K rate (19.1) showed growth with repeated strength in his walk rate (11.0). HIs only negative for the season was the lack of stolen bases (2), which was a surprise based on his early career path (27 SBs in the majors over 964 at bats and 54 SBs over 1,128 at-bats in the minors). Correa crushed LH pitching (.391 with five HRs and 19 RBI over 92 at-bats) with a high level of success vs. righties (.294 with 19 HRs and 65 RBI over 330 at-bats). He continued to post an elite RBI rate (19). This season his RBI chances should approach high league levels thanks to the strength of the lineup batting in front of him. His HR/FB rate (22.6) is an area to produce 35+ HRs with more upside when he learns to add some more loft on his swing. HIs fly ball rate (31.7 – career high in the majors) was low in 2017, but it is trending upward along with a declining ground ball rate (47.9 – 50.1 in 2016). Special bat with impact value in all areas. His only real question at this point in his career is his value in steals. Correa has enough talent to be drafted anywhere in the first round. Next step: .320 with 120+ runs, 35+ HRs, 120+ RBI, and 15+ SBs. One of the top targets in 2018 while offering a fun ride for Fantasy owners. Reddick had a huge jump in his contact batting average (.370) in 2017 plus he posted his best RBI rate (22) of his career. Josh finished with a career-high in his batting average (.314), but his power fell short of expectation due to a flat average hit rate (1.540) for the second straight season. During the year, he missed about a week twice. The first was due to a concussion and the second came from a back issue. His K rate (13.3) has been above his career average (16.6) in each of his last three seasons while having a league average walk rate (8.0). Reddick had almost an identical batting average against lefties (.315) and righties (.314), but he hit 12 of his 13 home runs off RH pitching. His final at-bats (477) give him a platoon feel despite holding his own vs. lefties. Last year Josh didn’t have one month with over 95 at-bats. Starting on June 6th, he hit .346 with seven HRs, 60 RBI, and five SBs over his last 295 at-bats. His HR/FB rate (7.4) has been under 10.0 in four of his last six seasons. HIs swing path does lead to fly balls (44.1 percent in his career and 42.3 in 2017). I don’t believe his batting average is for real and his power can’t approach his breakout season in 2012 without a huge jump in his HR/FB rate. A neutral hitter who tends to deliver with men on base. With 500+ at-bats, 80+ runs, 15+ HRs, 75+ RBI, and a handful of steals. A good strategy in Fantasy baseball is drafting a player that hits in front of or just behind a top player in the game. Reddick’s profile fits this idea if he does indeed hit fifth. His fly ball swing does give enough of a window to pop in power. After spending 15 years playing in Cuba, Gurriel finally had his chance in the majors in 2017. He hit .335 over 4,725 at-bats in his foreign career with 250 HRs, 1,018 RBI, and 121 SBs. Yulieski came to the majors with a great approach (11.1 percent walk rate and 7.8 percent K rate). In his first full year with the Astros, he struck out only 62 times in 529 at-bats (11.0 percent), but he barely took a walk (3.9 percent). Gurriel hit the ball well in April (.329), but he had minimal production (a home run and seven RBI in 79 at-bats). Over his next 21 games, Yulieski appeared to be hitting his way out of the majors (.182 over 77 at-bats with two HRs and eight RBI). He hit .316 over the last 4+ months of the season over 373 at-bats with 53 runs, 14 HRs, 60 RBI, and three SBs to show he belonged in the league. His swing had the most value against righties (.317 with 15 HRs and 57 RBI over 382 at-bats). Gurriel will need to improve against LH pitching (.252 with three HRs and 18 RBI over 147 at-bats). His most productive run came in June and July (.306 with nine HRs and 34 RBI over 186 at-bats). Yulieski had a shallow HR/FB rate (10.8) with a ground ball swing (46.5 percent) in his first season in the majors. Nice backend player with a chance to hit league average stats in all five categories with speed being the biggest wild card. With 550 at-bats, .300+ with 80+ runs, 20+ HRs, 80+ RBI, and close to ten steals. Marwin continues to improve as a player. This season he qualifies at five positions (1B, 2B, SS, 3B, and OF) making him a great moveable piece to cover injuries. Gonzalez more than doubled his 2016 walk rate (4.3 – 9.5 in 2017) while also improving his K rate (19.2). His surge in power was due to a jump in his AVH (1.746) and an improving swing path. Marwin had a career-high fly ball rate (36.2) and a career low ground ball rate (43.9) setting up a nice jump in his HR/FB rate (18.1). After a quiet first three weeks of the year (.143 with three HRs and six RBI over 42 at-bats), Gonzalez hits his way into the Astros’ starting lineup with a massive week (.500 over 22 at-bats with six HRs and 15 RBI). For the remainder of the season, he hit .309 with 56 runs, 14 HRs, 69 RBI, and six SBs over 391 at-bats. His bat was very good against righties (.322 with 18 HRs and 74 RBI over 335 at-bats) while still being productive against LH pitching (.250 with five HRs and 16 RBI over 120 at-bats). The key to his at-bats in 2018 may be the development of Of Derek Fisher. Marwin surely deserves a starting gig, but that may come from playing a different position almost every night. His huge pop in both RBI rate (22) and CTBA (.388) don’t look repeatable while also possibly being a sign of a juiced-up swing. Gonzalez will be a free agent in 2019 with Scott Boras as his agent. With 500 at-bats, .280 with 70+ runs, 20+ HRs, 70+ RBI, and 10+ SBs. If a Fantasy owner didn’t own McCann in 2017, he would think Brian was injured for part of the season based on his number of games played (97). He missed time twice last year due to a concussion and a right knee issue. He did regain his previous form at the plate (K rate – 14.5 and walk rate – 9.5) while delivering another strong season in his average hit rate (1.810). His CTBA (.289) has been under .300 in four of his last six season, which crushed any dream of offering a neutral batting average. McCann had similar power against righties (13 HRs over 252 at-bats) and lefties (five HRs over 97 at-bats) with more failure in batting average to LH pitching (.227). His bat was much better over the first half of the year (.255 with ten HRs and 43 RBI over 212 at-bats). Over the last three months of the season, Brian only hit .209 with eight HRs and 20 RBI over 153 at-bats. His HR/FB rate (14.8) has been above his career average (13.1) in each of the last three seasons. He tends to have a fly ball swing (43.1 percent in his career), but that number faded to 41.5 percent in 2017. His loss of at-bats over the second half of the year was self-inflicted possibly due to his knee problem. Evan Gattis wasn’t a factor late as he missed about five weeks over the second half of the year. Still enough in the tank to hit 20+ HRs with 425+ at-bats, but his opportunity of runs and RBI is much less by his lower spot in the batting order. His batting average has minimal chance of a rebound. Gattis was squeezed for at-bats by the rise of Marwin Gonzalez and the emergence of Yulieski Gurriel in 2017. Gattis missed time in August due to a concussion and a right wrist injury. He hit the ball well over his first 69 at-bats (.304 with three HRs and 16 RBI) but struggled over the next five weeks (.229 with two HRs and nine RBI over 83 at-bats). Evan recorded a hit in 14 of his next 15 games leading to a nice run (.361 with six HRs and 18 RBI over 61 at-bats). Gattis only played in 25 games after July 22nd with failing results (.198 with two HRs and 13 RBI over 91 at-bats). On the year, he had the lowest K rate (15.4) of his career with a weak walk rate (5.5). Gattis had more success against righties (.272 with eight HRs and 36 RBI over 213 at-bats). Last season Gattis had a sharp decline in his HR/FB rate (11.2 – 17.4 in his career) while having a slight upside in his fly ball rate (42.3). This season he looks poised to see more of the at-bats at DH, but the big question is where he’ll hit in the batting order. His RBI rate (19) says middle of the order, but Houston has plenty of depth and talent on this roster. His catcher eligibility makes Gattis a viable top ten catching option in 2017. Even with 450 at-bats, he should hit 20+ HRs with above average RBI form his position. Buy the power and hope he hits his way back up the batting order. Reed has lost his place in the first base food chain in Houston. He had a nice season in AAA in 2017 (34 HRs and 104 RBI over 476 at-bats), but his batting average (.261) came well below his career resume. Over four seasons in the minors, A.J. hit .298 with 95 HRs and 335 RBI in 1,509 at-bats. His walk rate (12.5) is very good with a slightly below league average K rate (22.1). In 2016, Reed wasn’t ready to make the jump from AA to the majors. He struggled to make contact with the Astros (34.0 percent K rate), but he did have a high walk rate (12.8). His swing was worthless against lefties (one hit in 15 at-bats with nine Ks) with an unimpressive stat line against RH pitching (.178 with three HRs and eight RBI over 107 at-bats – 39 Ks). His bat has plenty of upside, but he is blocked at first base and DH. He’s getting closer to the majors, and A.J. will offer plenty of power when he arrives. Nice insurance card if you have room on your Fantasy bench. Over four seasons in the minors, Fisher hit .282 with 66 HRs, 247 RBI, and 92 SBs in 1,471 at-bats. His game appeared to make a step forward in 2017 at AAA (.318 with 21 HRs, 66 RBI, and 16 SBs over 343 at-bats) leading to a call-up to the majors. His bat wasn’t ready to make an impact with the Astros. He made weaker contact (CTBA – .337) than AAA (.405) with a much higher K rate (32.5 – 23.3 in his minor league career). Derek shows the ability to take a walk (11.9 percent). This season he’ll compete for the left field job in spring training. Nice balanced skill set with 20/20 upside once he figures out how to make better contact in the majors. Tyler White (1B) – White was the player they called up in 2017 when they needed an option at first base to cover an injury. Last year Tyler had his best season in the minors in power (.300 with 25 HRs, 89 RBI, and seven SBs in 436 at-bats). Over his five years in the minors, he hit .301 with 73 HRs, 333 RBI, and 12 SBs in 1,641 at-bats. White has a good approach (12.2 percent walk rate and 15.2 percent K rate). In Houston in 2017 over 61 at-bats, he hit .279 with three HRs and ten RBI. This season he’ll start the year at age 27, so his window is starting to close to become an everyday player in the majors. A nice bat with playable value if needed to cover an injury. At AAA in 2017, the Astros had him play 1B, 2B, 3B, SS, and OF. I expect him to replace Marwin Gonzalez as the utility player in 2019. J.D. Davis (3B) – Davis hit .282 over 1,648 at-bats in the minors with 88 HRs, 312 RBI, and 16 SBs. He does have a high K rate (25.6) while doing a good job taking walks (9.0 percent). Last year J.D. repeated AA, which wasn’t a good sign for his future upside. Over two years at AA, he hit .273 with 44 HRs and 141 RBI in 836 at-bats. Houston did promote him to AAA (.295 over 61 at-bats with five HRs and 18 RBI) then to the majors in 2017. With the Astros, his bat was exposed (.226 over 62 at-bats with four HRs and seven RBI) due to a higher K rate (29.4). A nice power hitter who will have some growing pains when given a chance in the big leagues. Davis should start the year at AAA. Jake Marisnick (OF) – Marisnick hit .229 hitter over 856 at-bats over the last three seasons with 30 HRs, 92 RBI, and 43 SBs. Marisnick struggles against RH (.228) pitching with some growth against lefties (.266). HIs weakness in his K rate (34.8) hurts opportunity to get more at-bats. Jake should be the backup centerfielder again in 2018 with no chance of earning a starting gig. Verlander has 15 wins or more in nine of his last 12 years. His 2017 season looked shaky after his first ten starts (4.87 ERA and 1.409 WHIP) due to poor command (4.6 walks per nine). Justin allowed three runs or fewer in 16 of his next 18 starts (3.24 ERA with 118 Ks over 111 innings) setting up his trade to the Astros. With Houston over five starts, he went 5-0 with a 1.06 ERA and 43 Ks over 34 innings. Verlander issued only 15 walks over his last 82 innings (1.6 per nine) leading to a 10-1 record with a 1.65 ERA and 99 Ks. He made six appearances in the playoffs (4-1 with a 2.21 ERA and 38 Ks over 36.2 innings). His stuff had almost the same value against righties (.222 BAA) and lefties (.221 BAA). HIs AFB (95.8) was his highest since 2010 while having the most velocity in the playoffs (96.2). Batters only hit .205 vs. his four-seam fastball while also dominating with his slider (.211 BAA) and curveball (.231 BAA). Last year he left too many pitches up in the strike zone, which led to a career-high line drive rate (23.7). His HR/FB rate (11.5) was a career-high with two straight years of regression. Workhorse type arm with a chance to lead the AL in wins in 2018. His finish to last season gives him sub 3.00 ERA upside with 250 Ks with repeated second-half command. Keuchel ended being the bounce back arm to own in 2017, but he did miss a good portion of the season. Over his first 11 starts, Dallas went 9-0 with a 1.67 ERA and 69 Ks over 75.2 innings. A neck issue cost him the next six weeks. He struggled over his first three starts back in the rotation (14 runs and 31 baserunners over 12 innings) leaving Fantasy owners with doubts about his value over the last seven weeks of the year. Other than one bad starts (six runs and ten baserunners over six innings), Keuchel threw the ball well over his last nine starts (2.95 ERA and 49 Ks over 58 innings). In the playoffs, he went 2-2 with a 3.58 ERA and 32 Ks over 27.2 innings. Dallas suffered a left foot sprain in the playoffs leading to him wearing a walking boot to end 2017. He’s expected to be ready for spring training. Keuchel dominated lefties (.145 BAA), but he did issue 42 of his 47 walks to RH batters even with a high level of success (.236 BAA). His K rate (7.7) was a step below his best season (2015 – 8.4) while having more fade in his walk rate (2.9). His AFB (89.9) had more life than 2016 (89.3), but it was weaker than 2015 (90.4). Batters struggled to hit his sinker (.234 BAA), slider (.165 BAA), and changeup (.210 BAA). His sample size of a plus ERA is up to three seasons (2014 – 2.93, 2015 – 2.48, and 2017 – 2.90), so he no longer falls in the fluke column. He pitches for a great high scoring team. His low runs allowed and depth in games gives him elite chances at wins. 15+ wins with a sub 3.25 ERA, and 165+ Ks with 200+ innings pitched. Dallas just needs to find his elite command to offer more value. In today’s game, you don’t find many major league franchises that are willing to move a young ace arm which is reaching the prime of his career. Cole had a breakout season in 2015 (19-8 with a 2.60 ERA and 202 Ks over 208 innings), but his arm lost value over the last two seasons. In 2017, Gerrit threw the ball well over his first nine starts (2.84 ERA and 2.19 BAA). A disaster four-start run resulted in 23 runs and 44 baserunners allowed over 19.1 innings. Cole battled back over his next nine starts (6-1 with a 2.83 ERA, .227 BAA, and 54 Ks over 57.1 innings). Over his last 11 starts, he allowed under three runs in just two games leading to a poor finish to the year (4.80 ERA and 76 Ks over 69.1 innings). His AFB (96.5) remains one of the best in the game, but it did decline over the last two months of the season (August – 96.0 and September – 96.4). His best success comes from his slider (.229 BAA) and changeup (.226 BAA). Cole has the most trouble with lefties (.268 with 18 HRs over 377 at-bats) in 2017. Overall., his walk rate (2.4) and K rate (8.7) were in areas of strength. There is a lot of upside in this arm and pitching for a winning team will help his confidence. I don’t want to dismiss his couple of issues with a right elbow injury in the past, which may lead to TJ surgery down the road. Last season Gerrit did throw the most changeups of his career. The changeup is the pitch that will push him to the next level. A breakout/comeback season should be expected. Possible 20 wins with a sub 3.00 ERA and 225+ Ks. Just keep a close eye on his injury news. Strike one (55.4 percent) continues to be a problem for McCullers, but he did have growth in his walk rate (3.0). Lance had two trips to the DL in 2017. The first came in mid-June due to a back issue that flared up again in August. He ended missing over seven weeks of the season. Over his first 13 starts of the year, McCullers allowed two runs or fewer in nine starts (2.58 ERA with 89 Ks over 76.2 innings). After going on the DL in June, he pitched well in his next start (one run over five innings with no walk and eight Ks). From that point on, his arm had no Fantasy value (8.03 ERA and 1.865 WHIP). Lance was very good against lefties (.232 BA) while being just above league average against RH batters (.264 BAA). Most of his failure came on the road (5.14 ERA with a 1.390 WHIP). His AFB (94.7) had less value in September (94.1) and in the playoffs (93.6). His best pitch is his curveball (.191 BAA), which he threw more than his fastball (47.4 to 40.4 percent). In this offseason, McCullers talked about using his changeup more. Batters hit .409 against it in 2017 (.321 before his first DL stint). Flashy arm with K ability (10.0 in 2017 and 11.8 in 2016), but Lance struggles to stay healthy and pitch deep in games. There’s a lot to like based on his start to last season, but his name tends to draw a lot of attention on draft day. Sub 3.50 ERA when in the mound with 175+ Ks if he can pitch over 150 innings. I view him as too risky of a pick to draft as one of my top three starts in deep leagues. Headed into 2017, Morton had a career 46-71 record with a 4.54 ERA and 630 Ks over 893 innings. The spring training reports had him with more velocity on his fastball leading to him rising on draft boards in the high stake’s market. His AFB (96.1) was indeed his career high, which led to a career-high K rate (10.0 – 6.9 in his career). After his first three starts (2.81 ERA and 13 Ks over 16 innings), Charlie struggled over his next seven starts (4.54 ERA and 52 Ks over 41.2 innings) before landing on the DL for six weeks with a strained muscle in his back. When he returned to the starting rotation, Morton went 9-4 with a 3.34 ERA and 98 Ks over 89 innings. His success was highlighted by a great September (4-1 with 2.54 ERA and 33 Ks over 28.1 innings). He dominated lefties (.175 BAA), which was an area of weakness for most of his career (.288 BAA). Even with a nice season, Charlie did have some risk vs. RH batters (.273 BAA). His out pitch is his curveball (.122 BAA) while three other pitches had risk (sinker – .307 BAA, cutter – .270 BAA, and split-finger – .317 BAA). Morton is a ground ball pitcher (51.8 percent in 2017 and 55.0 percent in his career). Tempting arm based on his final stats, but his lack of resume and question with his secondary arsenal does invite failure. Pitchers for winning team with an improved fastball slight bump in command suggests a sub 3.75 ERA with serviceable strikeouts. Just remember, Charlie has never pitched more than 172 innings in his career. McHugh didn’t make his 2017 debut until July 22nd due to slow recovery with a right elbow injury. After a dull first start (four runs and six baserunners over 4.2 innings), Collin allowed three runs or fewer in ten of his last 11 starts leading to a 3.22 ERA and 58 Ks over 58.2 innings. His walk rate (2.8) drifted backward for the second straight year with a positive move in strikeouts (8.8 per nine). His stuff worked well vs. righties (.218 BAA) while showing risk against LH batters (.295 BAA). HIs AFB (90.7) is below the league average. McHugh throws a plus slider (.135 BAA) and cutter (.161 BAA) while both of his fastball options played well (four-seam – .247 BAA and sinker – .174 BAA). A bad 2016 (4.34 ERA) and a half season with an elbow issue does suggest that there is more underlying disaster with surgery being a possibility. Last season he did use a different approach to get batters out (career high fly ball rate – 45.0 and career low ground ball rate – 32.8). McHugh has one attractive season (2014 – 2.73 ERA) on his resume with solid command (2.5 walks per nine) and K ability (8.2 per nine in his career). Worth a dance, but I would tread carefully with any negative news in spring training. Over six seasons in the minors, Paulino went 13-10 with a 2.35 ERA and 232 Ks over 210.1 innings. He has a major league walk rate (2.5) and strength in his K rate (9.9). He missed the 2014 season with TJ surgery, and he’s yet to pitch over 90 innings in any year. In 2017, David started the year on the DL with a right elbow injury. After three starts at AAA (4.50 ERA with 13 Ks over 14 innings) and struggles with the long ball (three HRs), Houston called him up to start due to injuries in the starting rotation. In his best three games, Paulino allowed six runs over 15.1 innings with 18 Ks, but disaster caught him in his other three outings (15 runs and 24 baserunners over 13.2 innings) with six home runs allowed in his bad games. Major league baseball suspended David for 80 games for failing a drug test. HIs AFB (93.0) came in at the league average while only having success with his curveball (1.30 BAA). His future may be in the bullpen to help take some of the pressure off his arm. Player to follow with upside for sure, but his lack of length in season makes him only a short-term play if he’s throwing the ball well with an opportunity. After struggling in three of his first five games in 2017 (five runs and nine baserunners over five innings), it appeared Giles was pitching his way out of the 9th inning. He settled down over the next six weeks (two runs over 15.1 innings with 16 Ks and 12 saves). Ken had four bad outing in June (5.00 ERA and 1.556 WHIP). He found his rhythm over his last 24 games of the season (1.04 ERA and 40 Ks over 26 innings) while converting 13 of 15 saves. His walk rate (3.0) matched his career average with a slight slide in his K rate (11.9). Giles pitched well against both RH (.200 BAA) and LH (.196 BAA) batters. His AFB (98.4) was the best of his career. His success is delivered by an elite slider (.130 BAA), but he needs to locate his fastball (.342 BAA) better in and out of the strike zone. Over four seasons in the majors, Giles has a 2.43 ERA, 336 Ks, and 65 SVs over 244 innings. He looks poised to grow more this season, but his save chances may not be as great as one would think due to the high output of runs scored by the Astros. Sub 2.50 ERA, 100+ Ks, and 40 Ks with a step up in command. Devenski had a battle with being electric with closing upside to failure games when he allowed 11 home runs. Over his first 23 innings, he allowed only ten hits, five runs, and five walks while striking out 42 batters. Chris tripped up over his next six innings (7.50 ERA and .333 BAA). He settled down over his next 22.2 innings (0.79 ERA and .117 BAA) before allowing seven runs and four HRs over his next 6.2 innings. Devenski finished the year with a 2.01 ERA and .108 BAA over his last 22.1 innings, but he did lose his command (12 walks). Lefties only hit .111 against him and righties struggled, just not as much (.238). Most of Devenski’s mistakes (seven of 11 HRs) came against righties over 143 at bats. Chris is a fly ball pitcher (44.8) with a career-high HR/FB rate (12.3). His AFB (94.5) had more life than 2016 (93.3). Batters struggled to hit all three of his pitches (four-seam – .221 BAA, slider – .160 BAA, and changeup – .150 BAA). Closer worthy arm once he cleans up his mistakes with more upside with better command. Rondon wasn’t healthy in 2017, which was highlighted by a sharp decline in his walk rate (3.1 – 1.4 in his career) and continued failure with home runs (1.6 per nine). Hector pitched well over his first 11 games (0.87 ERA and 0.86 BAA), but he lost his way over his next 20 outings (14 runs, 27 baserunners, and four HRs over 18.1 innings). After nine shutout-innings with 14 Ks, Rondon didn’t belong on the mound in the majors (10.13 ERA, 2.250 WHIP, and five HRs over 10.2 innings). Somehow he didn’t allow a run or walk over his last nine innings with 12 Ks. His AFB (96.7) remains elite with more life over the second half of the year (97.5). Rondon also had success with his slider (.161 BAA). Both his four-seam fastball (.266 BAA) and sinker (.542 BAA) lost value. His struggles last year were due to bone chips in his right elbow. This issue wasn’t corrected after the season with surgery. Rondon has 77 saves over the last four years giving him a chance to pitch in the 9th if Houston is hit with some injuries in the bullpen. Headed into last year, Peacock had a 4.57 ERA and 1.426 WHIP due to a high walk rate (4.4) and high HR/FB rate (1.4). In 2017, Brad only had a slight uptick in his command (3.9 walks per nine), but he had a huge jump in his K rate (11.0 – 7.9 before last year). His AFB (93.1) is about league average, but batters only hit .190 against his four-seamer. Peacock had success with his slider (.186 BAA) and changeup (.154 BAA). Over the last four months of the season as a starter, Brad went 11-2 with a 3.21 ERA, 1.238 WHIP, and 123 Ks over 106.2 innings. The Astros will likely move him to the bullpen thanks to the increased depth of the starting rotation. However, Peacock is a nice option to tuck away if Houston endures a couple of injuries in the starting rotation.